When and where is The Handcrafted Cooperative held? The Handcrafted Cooperative will be held at the covered outdoor Morgantown Marketplace in Morgantown, WV. Please refer to the Events Page for the current schedule and location information. Who founded the event and why? The Handcrafted Cooperative was founded in 2017 by Morgantown native Megan Ursic. Megan has experience making and selling handcrafted products. At craft shows, she often competed against imported goods and commercial vendors. She searched for opportunities to sell at juried, handmade-only shows, but couldn't find any within the greater Morgantown area, so she made her own! Megan's professional background is in program management and interior design. On the side, she also makes and sells handmade items for little ones with her shop Buxy Baby. How do makers/artists apply and participate? All makers/artists must submit an application for each event. All applications are reviewed during the application window, and vendors will be selected for each category for the event. What types of makers/artists should apply? Participants are expected to only sell items as detailed in the application as category targets are carefully set when initial acceptances go out. I make food. Can I participate in the market? In Morgantown, food vendors are divided into two categories: Vending Trucks and Vending Carts. Both are required to operate with a City of Morgantown Business License, even if their headquarters are outside City Limits. Food vendors must show their appropriate Health Department permit at market check-in. Permits must be displayed as well. Please visit https://www.monchd.org for more information on requirements. Food vendors are selected based on quality, overall fit within the market, and what we feel will most appeal to the crowd. Makers/Artists are selected based on product integrity, originality of items, product cohesiveness and fit with the aesthetic of the cooperative (and what we feel will most appeal to our customers). We maintain targets in each category and work to have good variety and balance across groups. Tent setup and product merchandising are a very important considerations when we review applications. We want to see how you will stage your shop and will specifically choose participants who can help create an atmosphere where the setups are creative, professional, carefully styled and unique. The fee is $80 per event for a 10' x 15' booth space, and there is no fee to apply. In addition to the booth, all accepted makers/vendors are included in the Maker Spotlight on the website and promoted on our social media channels. Your fee goes towards labor and overhead costs to organize and manage the event. Event fees are paid online once acceptances go out, and detailed instructions are sent to all those accepted. Fees must be paid in full for the event within 7 days of acceptances. Unpaid spots after the deadline are filled from the waitlist. How and when will I be notified of my application status? You will be are notified of your status by the contact information you provide in your application on or before 7 days after the application window closes. Can I share booth space with another participant? No, sharing booth space is not allowed. We maintain a waitlist to fill cancellations. If you have to cancel, you must email thehandcraftedcooperative@gmail.com. A 50% refund is available up to one month prior to a scheduled event. Refunds are not given for cancellations within one month of a event. in that case, you forfeit your fee and space. Cancelled spots can not be sold or given to another vendor, and they will be filled from the waitlist at the discretion of The Handcrafted Cooperative. Credits are not given for a missed event. No-shows forfeit their right to participate in future events. Is electricity available at the venue? Yes, there are (56) 120V outlets (4 outlets per pavilion column). Limit one per vendor. Extension cords are not provided by The Handcrafted Cooperative. If an extension cord is used, the must be UL listed. No, please plan on utilizing your own data for Wi-Fi needs. Are there restrooms available at the venue? Tell me about booth quantity, booth size, etc. At the Morgantown Marketplace, we will use the parking grid to define vendor boundaries. Booth spaces are approximately 10' x 15' , and vendors must stay within boundaries. There are 48 vendor spaces in our location (27 covered, 21 uncovered). Participants are responsible for all of their own setup items (see below). I'm not local. Can you give me a virtual tour of the market place? If you're not local to Morgantown, take a quick tour of the Morgantown Market Place here. Setup is from 8AM- 10AM. All participants with oversize vehicles (trailers, box trucks) must load in promptly at 8AM and vehicles should be moved offsite as soon as possible. Unloading of vehicles must be complete by 9AM (this means no vehicles are permitted on the premise after 9AM). The market is open from 10AM - 4PM. Vendor tear-down is from 4PM - 5PM. 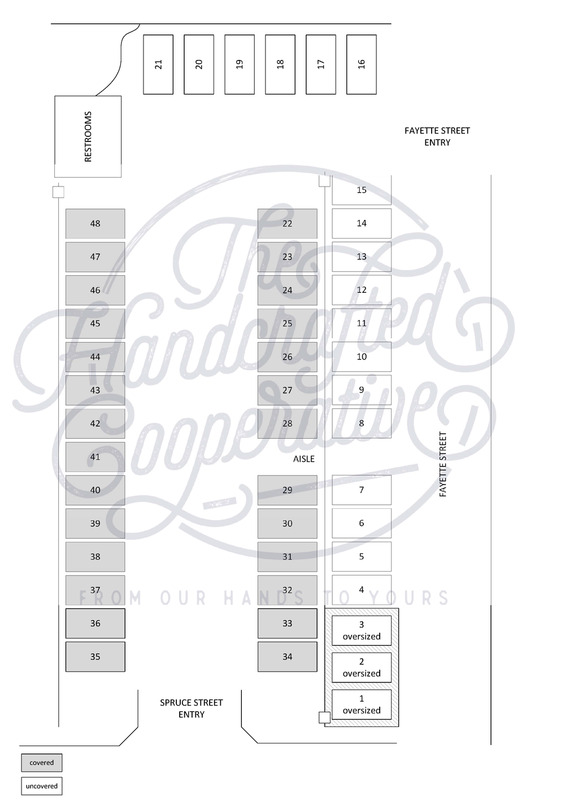 Booth spaces are assigned at the sole discretion of The Handcrafted Cooperative. Given the size and logistics of the event setup, we can not take specific space or adjacency requests unless there are truly extenuating circumstances (e.g. two vendors traveling together). Space assignments are emailed to participants along with the logistical details the week prior to each event. Do I have to be present at the event? The interaction between makers and customers is an important part of our event. All participants (i.e. the makers or business owners) are expected to be present at their space during the event. Yes. You are required to obtain sales tax licenses and submit the appropriate tax. The Handcrafted Cooperative does not cover any damage caused to your merchandise or displays during participation at the event. Although insurance is not required, it is strongly recommended. What if inclement weather is expected the day of the event? The event operates rain or shine, and we expect vendors to plan ahead, have the appropriate equipment (tents, tent walls, weatherproof storage for merchandise, etc), and be ready to vend regardless of weather. If you are not comfortable vending rain or shine, this may not be the show for you. In the unlikely case that the event is cancelled due to severe weather, the Handcrafted Cooperative will refund 20% of the rental fee with commitment to reschedule as soon as possible. The market is promoted via social media, word of mouth and local businesses/event calendars. All participants will be featured on the website and social media platforms. All participants are expected to actively partner with us to market and promote the events. This includes providing photos of your products to sell at the market, promoting the event on social media, sharing event invites online, etc.